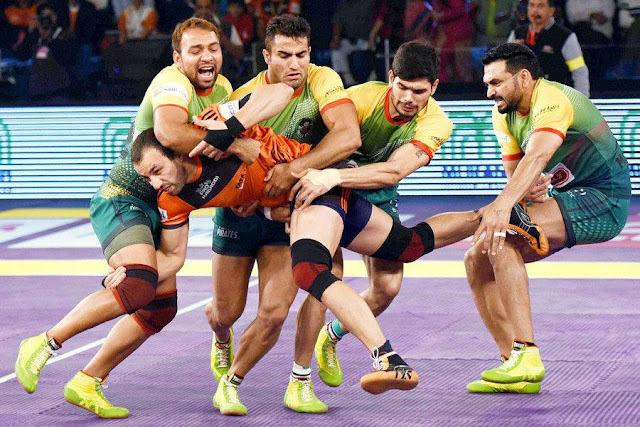 U Mumba showed remarkable composure in the last five minutes as they registered a comfortable 51-41 win over Patna Pirates in the Inter Zone Challenge Week of Pro Kabaddi League. Kashiling Adake scored 15 points while Shrikant Jadhav chipped in with 13 as U Mumba asserted their dominance over their rivals. Pardeep Narwal’s heroic effort of 21 points went in vain as Patna paid the price for a lackluster first half performance. It was a close affair in the first five minutes as both teams exchanged raid and tackle points to be levelled at 3-3. Darshan Kadian made a successful raid in the sixth minute as U Mumba led 4-3. Monu Goyat scored a raid point for Patna Pirates in the eighth minute to level the match at 5-5. Anup Kumar scored a raid point as U Mumba led 8-5 after nine minutes. U Mumba inflicted an all-out in the 10th minute to lead 11-5. U Mumba kept Patna’s main star Pardeep Narwal quiet for the first 10 minutes. Shrikant Jadhav made a successful raid in the 12th minute as U Mumba led 14-8. Pardeep Narwal opened his account in the 15th minute as Patna Pirates trailed 9-17. Narwal followed it up with a three more points as Patna Pirates trailed 12-18. Kashiling Adake scored a raid point as U Mumba inflicted an all-out to lead 24-14 at the end of the first half. The second half saw both teams trade raiding points as U Mumba led 27-19 after 22 minutes. Pardeep Narwal and Monu Goyat kept collecting raid points but Patna Pirates could not reduce the lead as they trailed 23-31 after 26 minutes. Patna Pirates inflicted an all-out in the 29th minute to cut the deficit to just two points. Shrikant Jadhav settled U Mumba’s nerves as he scored with two raids as they led 38-31 after 32 minutes. Darshan Kadian then scored another point as U Mumba extended their lead to 41-32 in the 34th minute. With less than five minutes to go, Pardeep Narwal made a successful raid as Patna Pirates trailed 36-42. It was all U Mumba in the last five minutes as they scored nine point compared to Patna’s five to win the match 51-41. Pardeep Narwal ended with 21 points but his effort went in vain.